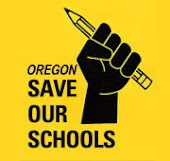 Oregon Save Our Schools completely supports the current plan to sunset the Oregon Education Investment Board as scheduled, March 15, 2016. The OEIB was never intended to be a long-term and permanent board in our state. Furthermore, it hasn't made much of a meaningful impact, but instead has created an expensive and ineffective bureaucracy. In her testimony, Pat provides many strong reasons to sunset the OEIB as well as proposes remedies on how to better use our state resources. This week, the Senate Education Committee will hear SB 215 which, at the request of Gov. Kitzhaber, seeks to extend the term of the OEIB and thus cancel the planned sunset. Both Pat Muller and Oregon SOS call to keep the sunset plan in place. It’s time to stop this failed, duplicative, and expensive experiment in education bureaucracy. o Because they have not been used for anything related to actual learning, they are worthless pieces of paper that have taken up valuable educator time – time that would be better spent planning and implementing quality instruction for students. The hours spent researching the data needed to fill out the compacts cost districts money. You would be hard pressed to find an educator who feels this process has been effective at improving instruction. o Members of the OEIB Board poorly attended a series of “roadshows” allegedly designed to elicit public input. In one memorable event in Portland, just one OEIB member appeared before an audience of several hundred angry parents. Throughout this sham process, public testimony given at the “input” events was subsequently ignored. Once a proposal is made by the OEIB, it rarely changes as a result of input by any parent, teacher, or other interested party. OEIB leadership presents the same proposals over and over again, refusing to alter plans that have been pre-ordained. o “Listening sessions” were held early on in OEIB’s life. They gathered public input in a workshop-type format that was similarly just window dressing. The attendees were guided through a structured “input process” and then the results were written for each table, mirroring not the input, but the intent of the planners. The results were then shared with the room. Most of the participants’ real concerns, brought forward during these sessions, never influenced any of the OEIB’s proposals. o “Stakeholder” groups are stacked with corporate education privatization-oriented lobbyists and representatives from groups that could personally benefit if they are chosen to run one of the community-based programs funded with educator dollars. Some even were rewarded with a job in one of those programs. The ODE and OEIB are employing more and more of these former lobbyists. o During Board meetings, members of the public have to wait until the end of many hours of meeting business for their three minutes of fame during public testimony time. Unsurprisingly, it is not possible to effectively comment on eight hours of ill-advised staff-led business in three minutes. This does not concern OEIB members, however, because, as previously noted, testimony rarely alters a word of their plans in any case. · It’s concentrating power in the governor’s office. o The public lost the power to elect a state school superintendent, disenfranchised permanently because of the perceived ineptitude of a single officeholder. Instead, the Governor became the superintendent in addition to his elected office. o Various committees have been either eliminated, moved or new committees formed and moved into a structure that was intended to sunset. The sunset seems as though it was a ruse to get previous legislators to go along with creating the superfluous new layer of government, with the promise that it would disappear after its limited mission was accomplished, when the real plan was to invest new powers in OEIB at every opportunity so that they could later say that unraveling the OEIB would be somehow too difficult or deleterious because of all its new responsibilities. This bill to eliminate the sunset is Exhibit A of that tactic. · It’s a waste of money. · There are no investments being made by this “investment” board. o Money is merely moved around, resulting in further reductions to core programs and increases in class sizes. The result is not helpful to students or Oregon’s public education system. · Proposals are unproven by research or based on false assumptions. o No examples are given of how OEIB’s proposals have worked in other states. Those who have tried to warn the Board of negative consequences are ignored. Make no mistake: this is a political agenda, not an educational improvement strategy. o The assumption is made that districts are not working as hard as they can and can be “leveraged” into better results without additional investments or removal of other requirements. For those of us who have followed the deliberations of OEIB, it has been hurtful to bear witness to the many insults embedded in their conversations, terminology, and proposals of OEIB members. Most seem to lead with palpable antipathy to our hard-working and dedicated classroom teachers. In many cases, the sole classroom teacher of 14 Board Members is silenced, ignored, and marginalized. Frequently, votes are 13 to 1, with the teacher providing the only objection. Such insolence flies in the face of public regard for our educator workforce, which is deeply respected by Oregonians. o A still widening achievement gap with no plan is the output of this Board. While the OEIB appropriates the language of equity, it operates from a corporatist agenda that exploits civil rights language in the service of privatization, demonizing of public education as a system, and sliding resources out of the State School Fund and to pet organizations and even religious groups. o The State English Language Learner Plan has been ignored in favor of a funding formula change proposal that blames teachers for ELL students’ inability to test out of programs at an artificially accelerated pace. Indistinguishable from the OEIB, Superintendent Saxton’s ODE is pushing this plan that actually ends resources to students in an arbitrary way – just as OEIB’s subcommittee on “accountability” desires. · OEIB has failed to leverage their own outcomes. o Kindergarten students continue to arrive not prepared for what is now taught at that level. An investment would be in order so all students would have access to early childhood education, instead of focusing on the accountability of current program. Most early education programs fail to pay a living wage. Certified teachers should staff pre-school programs in public schools. o The kindergarten readiness assessment told us what we already knew, and resulted in no actionable outcomes or additional investment. o The achievement gap is widening as we focus on accountability and bring forth proposals that would cut funding to the most vulnerable populations. o Outcomes consist mostly of reports and metrics. Classroom teachers see no difference now as a result of the work of OEIB. Workload has increased more than ever as resources have never caught up to the place they were before the recession and the jobless recovery. In short, this experiment has been an expensive disaster for public education and for the students we serve. By its own admission, OEIB has failed to meet its objectives and remains functionally accountable to no one. Unless the Legislature retakes its place as overseers of effective government in your one best opportunity to do so, more money will be wasted, ill-spent, and used to reward loyal friends, not to enrich students’ educational opportunities. Don’t be fooled by the carefully crafted narrative: this is nothing more than an ALEC-like takeover of public education. It will not improve our schools. · Allow sunset to take place. Legislators will be pressured to “support the governor”. · There’s no rush. See if the OEIB is actually able to accomplish something toward the end of session. Change the OEIB budget to an outcomes based budget. · Change mission of the OEIB to implementing the Quality Education Model.